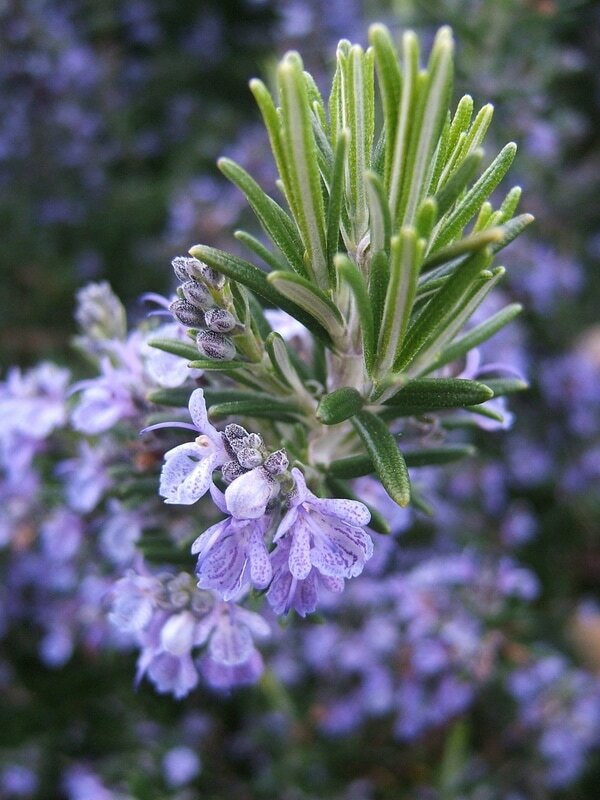 Rosemary is also one of the ingredients used in the preparation of Eau-de-Cologne and of Eau-de-Hongrie. Shrub, 2-5 feet. Propagate by cuttings taken as soon as the plants have ceased flowering. Strike in shade. Succeeds in any soil but does best in light soil, and full sun is essential. In bleak parts Rosemary rarely succeeds in the open, being as susceptible to cold, biting, winds as it is to frost. Does best against a wall or sunny fence. The Ancients were well acquainted with the shrub, which had a reputation for strengthening the memory. On this account it became the emblem of fidelity for lovers. It holds a special position among herbs from the symbolism attached to it. Not only was it used at weddings, but also at funerals, for decking churches and banqueting halls at festivals, as incense in religious ceremonies, and in magical spells.​In place of more costly incense, the ancients used Rosemary in their religious ceremonies. An old French name for it was "Incensier". ​Rosemary Wine when taken in small quantities acts as a quieting cordial to a weak heart subject to palpitation, and relieves accompanying dropsy by stimulating the kidneys. It is made by chopping up sprigs of green Rosemary and pouring on them white wine, which is strained off after a few days and is then ready for use. By stimulating the brain and nervous system, it is a good remedy for headaches caused by feeble circulation.